Fresh off our London Fashion Week AW18 runway show with Re:ne(w) By René Garza For Magpies & Peacocks (and with a couple of WWD and Vogue Italia features under our belt!) we are excited to present Catwalks & Classrooms 2018! 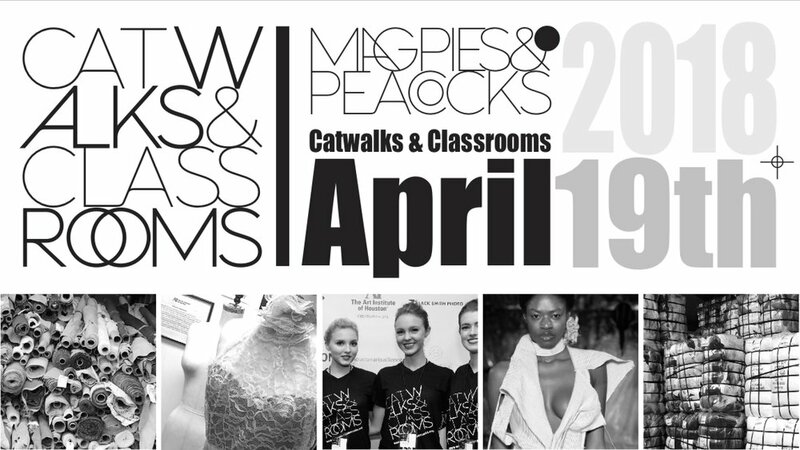 Magpies & Peacocks invites you to our 3rd annual Catwalks & Classrooms Sustainable Student Design Showcase honoring Christena Argo Reinhard, Jerri Duddeston Moore and Chloe Dao. What: Catwalks & Classrooms is the Magpies & Peacocks innovative sustainable fashion design competition showcase. Our eco-design students creatively up-cycle collections from donated post-consumer textiles provided by Magpies & Peacocks. This year will showcase up-cycled gowns from students attending Fashion Institute of Technology (FIT) NYC, Art Institute Of Houston, Houston Community College and Glassell School, among others. You will also get to experience the zero waste ‘Re:ne(w) by René Garza For Magpies & Peacocks’ collection just back from debuting at LWF, alongside the work of local artists; enjoy complimentary food, presented by local chefs; sip custom cocktails provided by Faust Distributing; partake in a curated silent auction; shop a unique sustainable Co:lab Marketplace; and enjoy the contemporary sounds of local DJs.